There are a lot of reasons to enjoy following open-source software, one of which is the ability to learn from the code that others have built. Even though there is a lot of open-source software, it can be difficult to know how to follow along with development at this pace when you aren't familiar with the tools. If you're an experienced developer who knows how to work with bug trackers, version control, and so on, then you're not the target audience for this tutorial. However, if you're someone who is a fan of WordPress and wants to learn how to follow along with the development of the project, then continue reading. 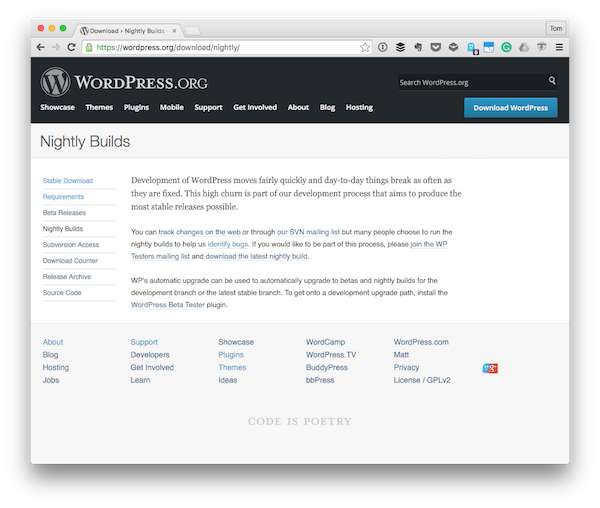 In this article, we're going to take a look at the definition of nightly builds, how we can prepare our system for grabbing the latest version of the WordPress source code each day, and how we can use it on our own system. Before we jump into how to grab the latest version of the source code each day, it's important to understand the definition of "nightly builds". The phrase is not something that's exclusive to WordPress. In fact, a lot of software, both open and closed-source, includes nightly builds. Whether or not we, as the public, have access to them is another matter. An event which occurs once every night. Then again, the phrase itself doesn't exactly sound like technological jargon, does it? No matter. You can track changes on the web or through our SVN mailing list but many people choose to run the nightly builds to help us identify bugs. If you would like to be part of this process, please join the WP Testers mailing list and download the latest nightly build. If you're interested in participating in more than just grabbing the source code and following the steps mentioned above, then please visit the link above. For the remainder of this article, we're going to look at what's needed in order to grab the nightly version of the source code. There are a number of different version control or source code control services and applications that are available. The WordPress project uses a self-hosted version of Subversion to handle the version control for the project. If you're not familiar with Subversion, then you can learn more about it on the software's homepage. However, Subversion has been around for quite some time and is widely used in a number of different companies and projects. This tutorial is not going to provide an in-depth guide for how to use Subversion and all that you can do with it, but it is going to provide you with everything you need to know in order to install it on your machine and to grab the latest version of the WordPress source code. Because Subversion is so widely used, there are a number of different clients from which you can choose, regardless of the project of the operating system in which you're involved. TortoiseSVN is available for Windows. Cornerstone and Versions are available for OS X. Of course, these are just a handful of the options that you have. Regardless of the operating system that you use, the one thing we all have in common is that Subversion is available as a command-line tool, so that's what we're going to be using in this tutorial. 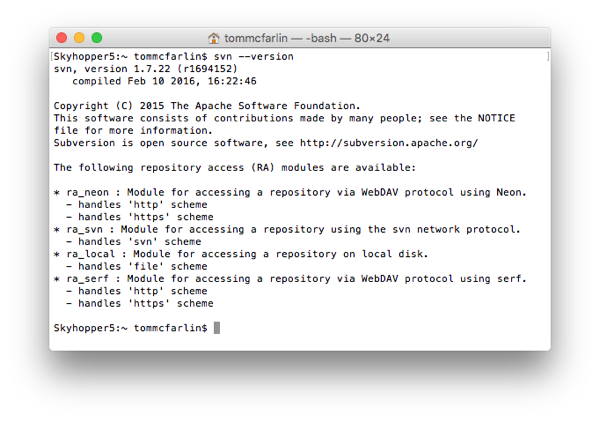 Installing Subversion via the command line depends on the operating system that you're using. If you're using Linux, you'll need one type of installer. If you're using Windows or Mac OS X, then you'll need one for each of those systems. Once installed, though, the commands that we issue in the Terminal throughout the rest of this tutorial will be the same. 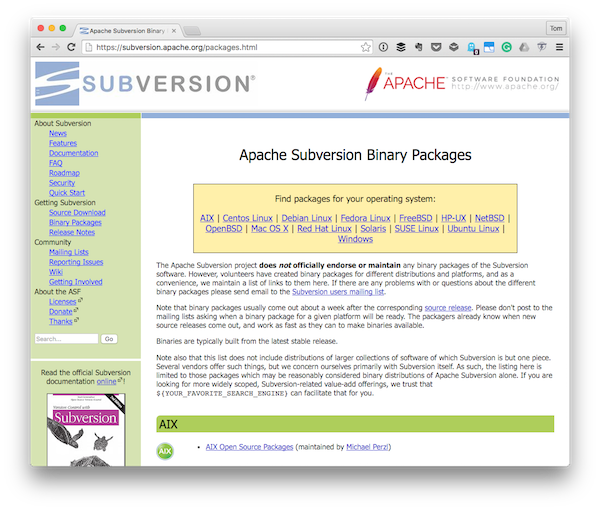 First, navigate to the Subversion Binary Packages page and find the version that corresponds to your operating system. Secondly, download the installer, walk through the steps that are provided, and then return to this tutorial. But the actual output that you see may be slightly different. The bottom line is that if you're able to execute the svn command, then you should be able to follow along with the rest of the steps in the tutorial. Before we grab the latest copy of WordPress, we need to make sure we have a directory set up in which we will be downloading the latest source code. For me, I'll be placing them in /Users/tommcfarlin/Downloads since I'm using OS X. Therefore, all of my commands will be relative to that directory. And yours will be relative to whatever directory you choose for yourself. So in my Downloads directory I'm going to create a directory called wp which will house the source code we check out from the official repository. In your terminal, enter the command responsible for making a new directory. And now I have an empty directory into which I can pull the WordPress source code via Subversion. The act of pulling the latest version of source code from a Subversion repository is called a "check out". So to check out the latest version of WordPress, we'll need to issue a Subversion command in the command line. A Subversion command for checking out the source code (which is easy enough being co). The URL of the repository from which we'll be pulling the source code (which is https://core.svn.wordpress.org/trunk/). Once done, the Terminal should begin to print information out as it's pulling down the latest version of the source code. One very important thing to note is that this is ideally meant for experimentation. Don't attempt to push any code into the repository (you need to submit patches in a formal way, which is beyond the scope of this tutorial as it stands). Think of this as simply a way to grab the source code for "read-only". At this point, you should see that you have a trunk directory in the wp directory you created earlier in this step. The trunk is a Subversion naming convention out of which the main line of development on a project is done. 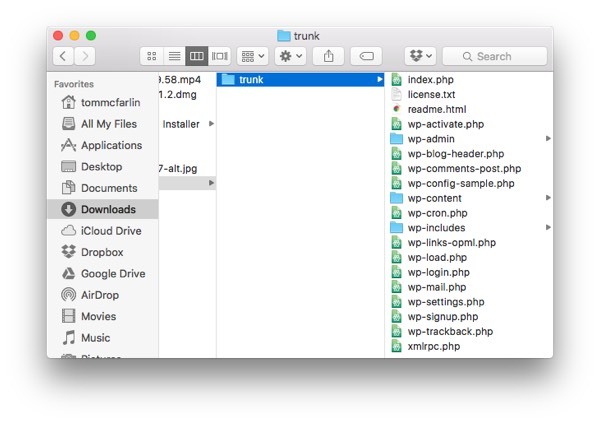 If you navigate into the trunk directory using the command line or even your operating system's user interface, you will see the familiar directory structure of the WordPress application. This means that you can actually set up a working version of WordPress as you would if you had downloaded it from the project's homepage. 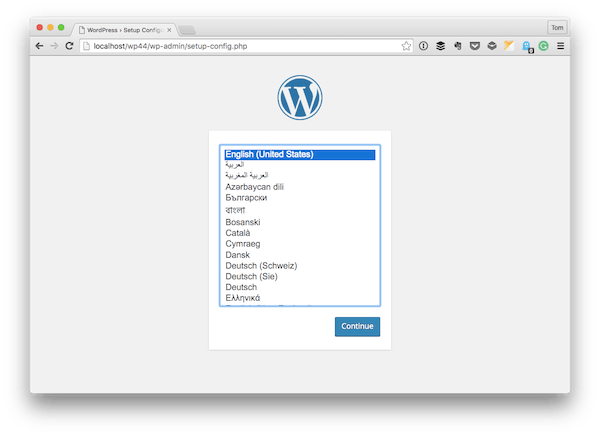 In a previous post, I provided a detailed walkthrough of what's needed to install the WordPress application. If you're completely new to WordPress, then please review that tutorial as it will provide you with all of the information that you need to know to get WordPress up and running. Once done, you'll be running a bleeding-edge copy of WordPress including all of the features that are in development. If you've never done this before, it's really neat to see what's coming downstream in the next version. As you continue to work with the source code or you want to make sure that you're working with the most recent version of the source code, you're going to want to update it. And that single command will pull down any code that was merged since the last time you checked out the most recent version of the source code. Note that when you do this, you run the risk of breaking something in your installation, but that's the nature of running bleeding-edge nightly builds. 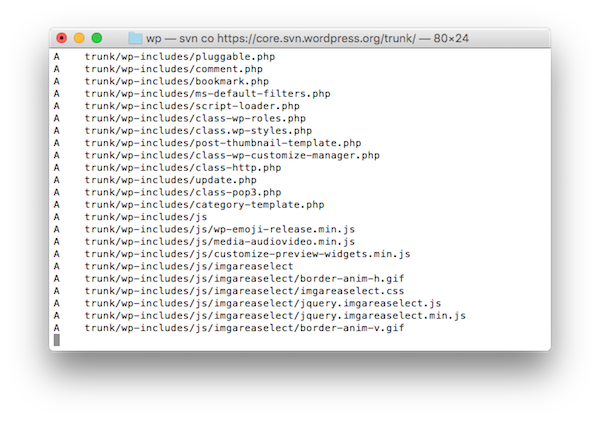 Though one of the main purposes of this tutorial was to walk you through getting Subversion installed on your machine and using it to check out the WordPress source code, you can also grab the latest build of WordPress anytime by using this URL. No, this was never meant to be "the long way" to obtain the source code. Instead, it's to get you working more as a developer through the use of tools and processes that are used daily when working with WordPress. Regardless of whether you want to look at all of the new things that are pushed into WordPress core each day or are looking to eventually contribute a patch to the application, having access to the nightly version of the code is a lot of fun. If nothing else, having access to an open-source project such as WordPress, where hundreds of people are actively working on it, can teach you a lot about handling bug reports, tickets, patches, features, merges, and so on. I do not recommend running this code outside of anything but a local development environment. That said, if you're a developer and you're interested in testing code that's on the bleeding edge, nightly builds allow you to do exactly that. For those who are interested in continuing to learn more about WordPress, we have several courses specifically on this topic. On top of that, we also have plenty of plugins in the marketplace that are available for you to download, to study, and to use in your daily work.